So I actually ended up spending yesterday researching the history of The Battle of Brooklyn–also known as The Battle of Long Island–for a game Julio Terra and are working on for Come Out and Play. The game would consist of two teams defending and conquering territory in the current landscape with reference to the landscape that existed at the time of battle. Ideally, historically important destinations will be geotagged, and players can see where they are on period maps, relating it obviously to where they are in the contemporary city. The “Redcoats” will be given specific objectives to capture, while the “Revolutionaries” will be given defensive positions, and can send out expeditionary forces to prevent capture. The capture and defend mechanism is at the moment envisioned with cameras. The Redcoats photograph predetermined locations and icons, and email them back to headquarters, while the Revolutionaries try to defend those positions by photographing the Redcoats first. The game may or may not end with a variant of Capture the Flag at Stone House, the likely game headquarters, and site of one of the final critical skirmishes of that battle. Each team’s status along the way would be updated with reference to how the actual battle played out, so that players have the opportunity to learn about the historical events that occurred in the locations the game is taking place, and develop a deeper appreciation for Brooklyn’s past and relevance to early days of the Revolution. The point to the British seizing Brooklyn and New York was to wrest control of the Hudson River from the Americans and separate New England from the remainder of the Continental United States. June 29, 1776: The British main army under General William Howe arrives in the New York Harbor. Through July: The greatest British expeditionary force to date assembles and lands at Staten Island. August 22: 15,000 British soldiers cross the Verrazano Narrows in 88 frigates and land at Graves End. Â Washington continued to reinforce troops on the ridges of what is today Brooklyn Heights and Park Slope south through Sunset Park. 2. Eastward of the ridgeline and behind the Revolutionary forces and northwards towards Brownsville, New Lots and what is today the Cemetery of the Evergreens. 1. The eastern flank turned westward and attacked the Americans near Bedford and Fulton. 2. The western flank drove eastward near what is now Sunset Park. From here it gets more chaotic, but in short, the American forces at the north end of today’s Prospect Park are violently routed up Flatbush and down the slope on Port Road (near 1st Street). Â They felled a large oak and defended themselves in Prospect Park at what is known and marked as Battle Pass, and this bought them some time. Meanwhile, the Americans that were fighting off the western invasion withdrew northward along the Gowanus Creek (today the Canal). While the final offensive at Stone House cost Americans many casualties, it also gave the remaining forces the opportunity to withdraw to the heights. Heavy rains ensued, and Howe opted for seige over head-on attack, after the defeats in Boston. 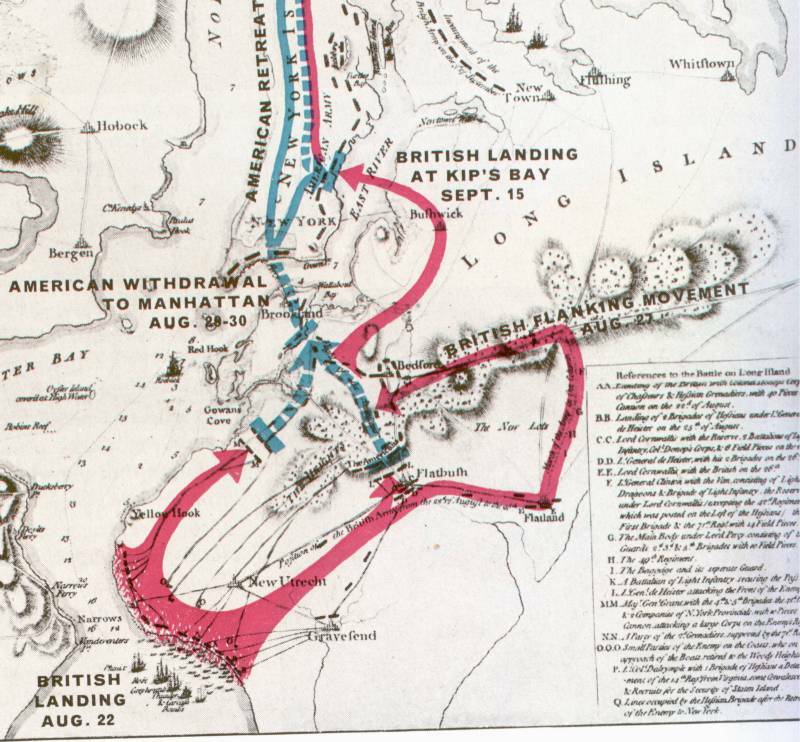 August 28 et seq: Washington retreated across the East River to Manhattan. © NYU ITP 4-in-4 » The Battle of Brooklyn 2010, All Rights Reserved.